In a 5,000 square feet vault protected by a five-tonne metal door are safe deposit boxes rented out over 70 years to the business elite and royal families of eastern India—and some even from neighbouring countries such as Bhutan, Bangladesh, Nepal and Tibet. 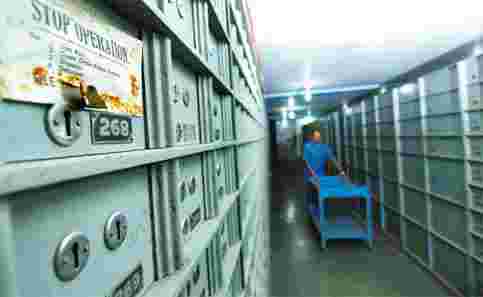 In the name of “legitimate recovery" of overdue rent, the sparring sons of a legendary Kolkata industrialist are ripping open these safe deposit boxes that are housed in the basement of Security House, a landmark building in Dalhousie Square that has the offices of their firm, Calcutta Safe Deposit Co. Ltd (CSDC). Founded in 1939 by Amritlal Ojha—one of the first few Indians to own and operate collieries in India—CSDC was modelled on safe deposit centres in London that Ojha had come across during a visit to Europe in the early 1930s. He obtained permission from the British government to launch one in Kolkata in 1935, and four years later, CSDC came into being with the legendary Sir Badridas Goenka, grandfather of RPG Group chairman Rama Prasad Goenka, as its first chairman. Though caught up in a family feud for the past 50 years, which has, at times, caused “disruption in operations", CSDC continues to have at least 5,000 “active" customers, according to Sriram A. Ojha, one of the founder’s nine sons from his second marriage, who as a member of the court-appointed board of management currently runs the company. Many continue to keep in its custody large safes and trunks, some under telltale tamper-proof hessian cover as the management always took the three wise monkeys’ approach—hear no evil, see no evil, speak no evil, according to Pramod Ojha, one of the founder’s sons and a member of CSDC’s board of management. But there are perhaps as many “dead lockers" as active ones, or ones that have “not been opened for decades", according to an employee of the firm, who did not disclose his name. “It is almost impossible to trace thousands of tenants," he said. “We have sent several notices, asking them to immediately clear their dues, but they don’t respond." For instance, hundreds of Hindus, who in 1947 had migrated from Bangladesh uprooted from homes, had on arriving in Kolkata rented lockers at CSDC to put away their valuables in safe keeping, he said. Many of these people are now untraceable. Even on Thursday, when this correspondent met with Sriram A. Ojha at his office in the basement of Security House, some 54 notices were dispatched, he said. With revenues from locker rent dwindling and CSDC’s cash deposits in banks frozen by court orders, Sriram A. Ojha is now threatening to break open safe deposit boxes to prise out outstanding rent from defaulters. “I have 25 employees to pay every month," he said. “That apart, we have a municipal tax liability of around Rs1.5 crore." In September, CSDC prised opened 10-12 safe deposit boxes, but Sriram A. Ojha claimed nothing was found inside them. “These people didn’t respond to our notices because they knew their boxes were empty," he said. “This is completely unauthorized," said Navin Chandra Ojha, another member of CSDC’s board of management, who claimed he was “forcibly ousted" from the company a year ago. Navin Chandra Ojha had even lodged a complaint with the police after CSDC broke open safe deposit boxes of some defaulters, but the police refused to take action because “the complaint hadn’t come from the tenants of the lockers", according to Sriram A. Ojha. Legally, CSDC might not have done anything wrong, according to a partner at a leading law firm in Kolkata. He did not want to be named because his firm had in the past represented a faction of Ojha brothers in their protracted legal battle over control of CSDC. CSDC’s relationship with its tenants is governed by “a private agreement", under which the management has the right to break open a locker and recover dues by selling what it finds, he said. “But is it ethical? Is it being done in the right manner?" State Bank of India (SBI), the country’s biggest bank, would, for instance, deal with defaulters in a different manner, according to an official who did not want to be identified because he isn’t authorized to speak to the media. SBI would send notices to the defaulters for three years and though it is not mandatory, it would even issue a public notice in newspapers before breaking open a locker, according to him. “If, in the end, we were compelled to break open a locker, we would do so in the presence of two officers, a goldsmith, a lawyer and a customer of repute," he said. “The five persons would jointly create an inventory of the contents; we would get the valuables verified by the goldsmith, and take out for selling only as much gold as we need to recover our dues. The rest would be put in safe custody in a sealed cover, signed by the five persons." Sriram A. Ojha refused to share the “minutes" of the intrusion into defaulters’ lockers at CSDC. Amritlal Ojha, who had brought under his control some 14 collieries and had founded Great Social Life and General Insurance Co., died in 1944, leaving behind 11 sons and one daughter from two marriages, according to Pramod A. Ojha. From the early 1960s, the nine sons from Amritlal Ojha’s second marriage have been fighting battles, at home and in courts, over the control of his estate. One by one, the Ojhas lost control of all their key businesses, except CSDC—in 1955, part of the insurance company was seized under nationalization of life insurers; in 1967, general insurance companies were nationalized; and finally in 1972 and 1973, the collieries were nationalized. Even the principal holding company of the family, Amritlal Ojha and Co. Pvt. Ltd, was run to the ground and was liquidated, said Sriram A. Ojha, grudgingly recalling the 40-year-old legal battle with his brothers. What they continue to fight for is Security House, which Navin Chandra Ojha values at Rs50-70 crore, and CSDC—a repository of forgotten legacies stashed behind a five-tonne metal door.